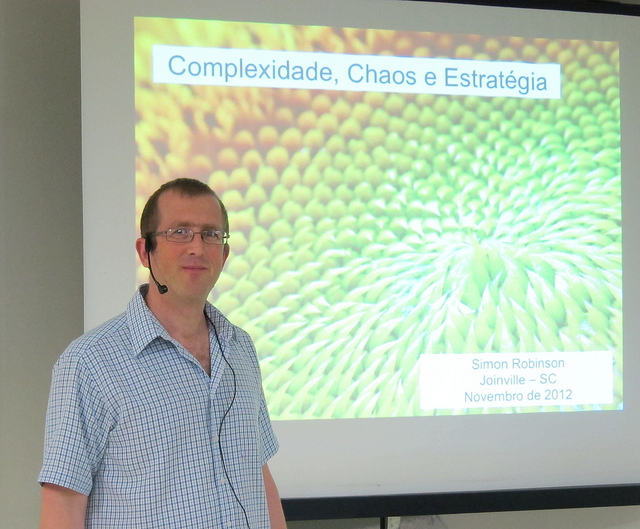 I have just returned to São Paulo from Joinville in the south of Brazil where I’ve spent the last three days teaching chaos, complexity and business strategy to the students of Sustentare Escola de Negócios (Sustentare Business School). On Thursday evening I gave my open lecture to the local community Making Sense in a Complex World, and then on Friday evening and Saturday morning I gave my class to students from a number of different MBA courses which meant quite an interdisciplinary group in terms of their backgrounds, organisations, roles and responsibilities. If you are a regular visitor to my site you will know that I often talk about the history of science, but in my evening lecture I wanted to explore a range of themes relating to how we make sense of our world. I also wanted to really place this in the context of Brazilian history, culture and modern society, and I so I created this slide to contrast the evolution of scientific thinking with historical events in Brazil. The pictures on the slide were able to help me discuss the discovery” of Brazil in 1500 by Pedro Álvares Cabral, the escape of the Portuguese royal family to Brazil in 1807, the industrialisation of Brazil in the 1930s (the painting is Operários by Tarsila do Amaral, and the second dictatorial period (illustrated by some key musicians such as Gilberto Gill, Caetano Veloso and Roberto Carlos, many of whom were imprisoned or exiled). Although Brazil is emerging as a dominant economic superpower, it has a huge issue with a lack of education, not only in the lower classes, but throughout the whole of Brazilian society. In the dictatorial period, the philosophy departments in universities were closed down, and given that the dictatorship only came to an end in the mid 1980s, many Brazilians either withdraw, feel extreme discomfort or have no way to engage in discussions around meaning and being, as was being explored in the hermeneutics and phenomenology which emerged from continental Europe just as quantum physics was exploding in science in the 1930s. For this reason I do believe that I am perhaps the only person in Brazil teaching complexity theory in business from the standpoint of European philosophy. Sustentare is run by Professor Wilmar Cidral, and given this context it is to his great credit that he actually took a risk with me by inviting me to teach in the way I do. However, having said that it is really interesting to me to see the quality of students who come to Sustentare, all of whom while being challenged by me in a way in which they probably never have, manage to work through their discomforts and confusion to arrive at the end of day two of my teaching happily throwing words like self-organisation, emergence and mental models in the discussion of the final exercise I give them. The three books I recommend to students to read after my course are Peter Senge’s The Fifth Discipline, Fritjof Capra’s The Web of Life and Margaret Wheatley’s Leadership and the New Science. These three books relate to the first three parts of my module, which are mental models, systems models and business models, and also are all available in Portuguese. 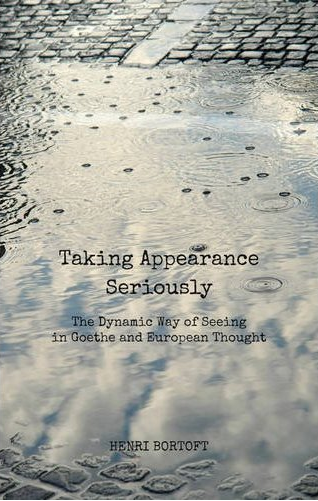 It is only in the last month that Henri Bortoft’s Taking Appearance Seriously – The Dynamic Way of Seeing in Goethe and European Thought has been published, but having been taught by Henri this is where my of my own inspiration for my lessons come from. Another key factor that makes my own teaching at Sustentare such a delight is that Wilmar always invites Prof. Valéria Barreira to do the translation for students. As well as having a background in English literature, she is also extremely knowledgeable about my entire area, including Heidegger, and this is vital in order to be able to provide the students with the highest possible quality of class. I wanted to introduce Henri’s book in order to show that this in fact is what we have been studying at Sustentare these last two years, and I was going to make a joke about me worrying about my appearance which Brazilians take very seriously. Discussing this joke with Prof. Valéria beforehand led me to discover that the word appearance in Portuguese only has one meaning which is your physical appearance, and not the second more philosophical and verbal meaning relating to the coming-into-being or the happening of a phenomena. This is just one example of when dealing with incredibly complex insights, I can only teach with a translation which is not literal but which can modify, at speed, my thoughts into ones that make sense for a Brazilian audience. They continued to surprise me as we looked at mental models and how these affect the way we see the world at a very fundamental level. I know I have shown these pictures before, but I will add them again so that my narrative makes sense to those who have not seen them. Our discussion took us into discussing the divided brain, and how our concepts of what the division means has changed from the 1970s to the present day. Our experience is mediated in both halves of the brain, but whereas the right brain presences what is new and processes experience as a whole, this is then presented to the left brain which re-reresents an abstracted version of reality to us which is symbolic, analytical, reductive, intellectual and fragmented. It is an abstraction and not a direct experience of reality itself. It was surprising to me what followed when discussing the four ways of knowing which enable us to have a more rounded way of knowing which is no longer dominated by the left brain. 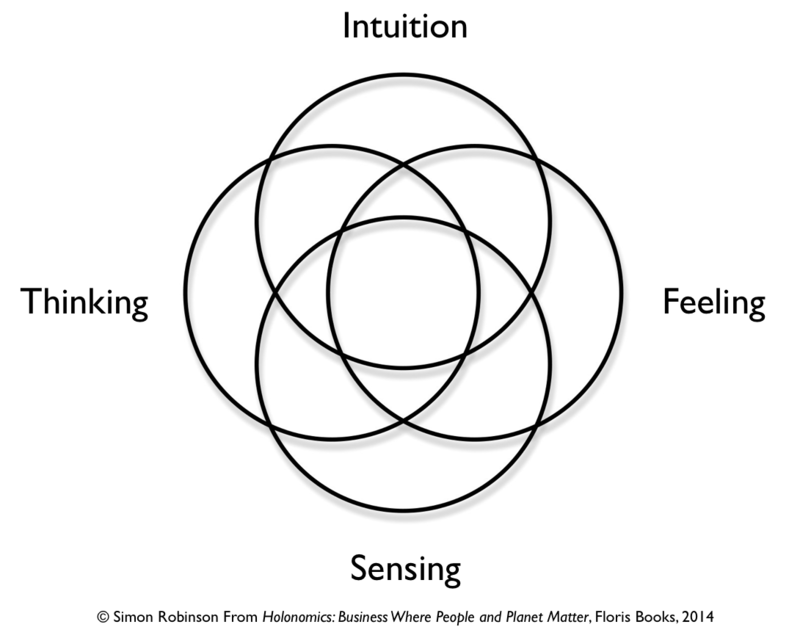 These four ways of knowing are thinking, sensing, feeling and intuition. We talked about the emotional element of the Brazilian psyche and how emotion has a huge role to play, often disruptive, in cognition as psychologists continue to discover. However, opposite to thinking is not emotion, but feeling, which is more than emotion. 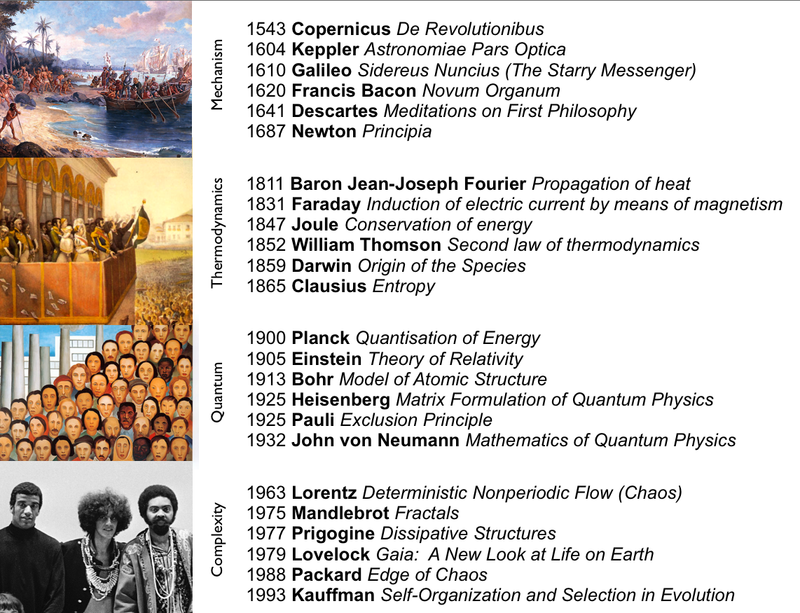 I look at the history of science because we often think that the evolutionary path science has taken was the only one possible, since science is rational, objective and independent of human subjectivity, but it is not. Many different paths could have been taken, and in fact they were, as exemplified by Goethe’s delicate empiricism, a dynamic way of thinking which starts in the sensory realm and leads us to the intuitive realm, one where a complex system can only be comprehended in our scientific intuition (as opposed to that intuition that gives us a sense of feeling what is right or will happen). In my Thursday evening talk I discussed a Johnny Walker advert which shows the giant, which as legend tells is said to be sleeping in Pão de Açúcar (Sugarloaf mountain), finally waking up and walking tall. The giant is a metaphor for Brazil, and so one of themes which ran through these few days was the low self-esteem in the Brazilian psyche, a theme I have written about before (I never want to hear Brazil say sorry for their sport). I am very conscious of this aspect of Brazilian thinking, which often values things from outside of Brazil far more than what is here in Brazil. See for example my recent gentle rant Where are all the t-shirts written in Portuguese? So what I did was to try and include as many positive Brazilian business case studies as possible, including Ricardo Semler and Semco, Luís Norberto Pascoal and DPaschoal, Sérgio Chaia and Nextel Brasil, Natura and Pedro Passo, Transition Towns Brasil, Symnetics and Maria Auxiliadora’s work on community and dialogue, and Brazilian creative agency Mandalah and Lourenço Bustani. 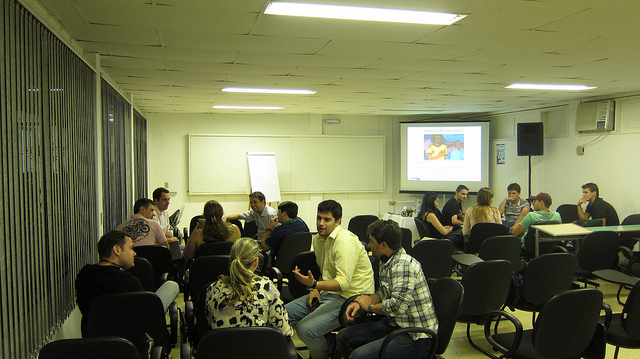 If we can raise the level of self-esteem in Brazilians, then maybe they will come to discover just what insightful and creative business leaders Brazil does have. These business leaders are connected with nature in a way in which the very left-brain leaders of the western world are not, and therefore Brazil can have a huge role to play as one of the planet’s guardians, recognising that we do not live on an infinite planet where infinite linear economic growth is the dominant yet insane mental model. 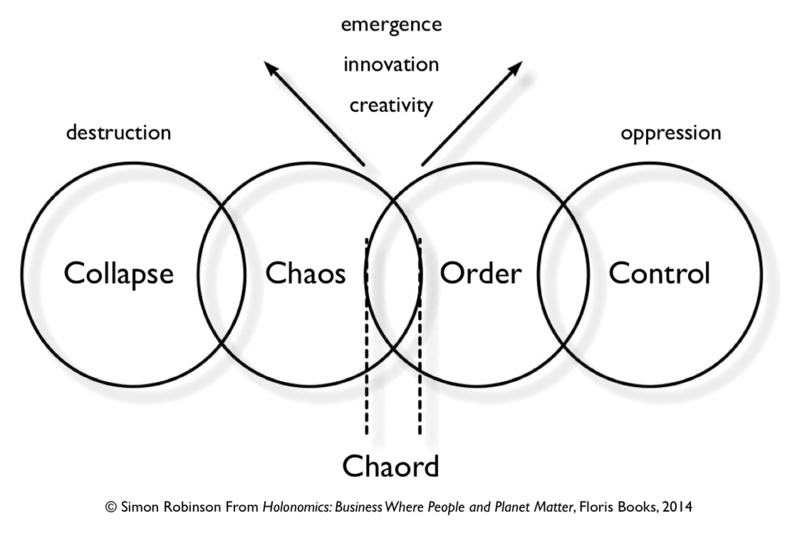 We followed this theme through into the second day, when after having studied complex and chaotic systems in both nature and business, we came to look at the implications for business strategy. I based much of this discussion around what Robert Safian of Fast Company calls Generation Flux, the new generation of entrepreneurs who thrive in chaos. Can Generation Flux Learn from Starlings? This model comes from Dee Hock, the founder of VISA who created the VISA organisation based on the principles of natural systems. So what we did was to discuss chaos as defined from a more every-day informal sense by Safian, and from a more scientific systemic perspective. We remembered our conversations the previous day about the Brazilian empirical mind, and developed this idea by discussing how Brazilians have already lived through intense and insane chaos, which is still a part of their psyche. This has led to them being creative with limited resources, which is a form of intelligence which is not academic but which is very much grounded in reality. Perhaps then Brazilians are already Generation Flux without actually knowing it, due to the desire to copy the West, however economically chaotic it is becoming, as opposed to understanding what is in their hands, this wonderful resilience of a people full of feeling and emotion living in a country of gorgeous and profoundly rich nature. Can Brazilians pivot out of their current path of following the West into one of true leadership which is comfortable with chaos? I finished the teaching side of the class with something I have not taught before which was the four qualities of knowing as taught by Goethian scientist Margaret Colquhoun, author of New Eyes for Plants who taught me at Schumacher College and who Maria and I visited in Edinburgh in January of this year. I have written extensively about this process in my article Intuition, Paradigm Shifts and the Four Qualities of Knowing, a process which is more akin to alchemy and pilgrimage as opposed to an objective and rational science. When you think about the qualities of knowing, you can begin to gauge where a person is in their conceptual thinking, and as one student remarked who was a business consultant, this is an important skill when working out in what way to explain concepts to people who may not yet have the mental models to be able to integrate into their current world view. It really is always a fantastic experience to teach at Sustentare, and I could have written a lot more in this article I can assure you. We talked about language, and the fact that language is dynamic and rich, and how good translations are often quite far from literal. We talked about the Brazilian Portuguese word saudades, which while being translated into missing you, for Brazilians holds so much more meaning and resonance that is lost in translation. Although I do rant a little about how much bad English, or maybe not very creative English is being introduced in Brazil because it is seen as chic, however cheesy, there are of course great examples too, such as Bike Forever who have created a globally recognised conscientious brand while avoiding the mistake of writing Forever Bike. This is sophisticated English and I have seen many company names which do not understand that the order of words is not based on a rigid grammatical rule, and for native speakers word order can often be everything where nouns become a little bit adjective-like for example. Maybe though I should not try and fight against the flow, but go with it. Maybe if Brazilians really are insistent on their use of English I should create some new words for them, instead of having them use phrases such as “Property of this brand” which was emblazoned across the chest of a very chic male model in an advert in the inflight magazine for Gol. I was talking to Valéria about language and we were talking about Brazilian resilience. I came up with the word Braziliance which for me is a combination of the words Brazilian, brilliance and resilience. So Brazil, you can have this word for free from me. Maybe someone will add it to their flag which already has the words order and progress. Or maybe someone will print a cool t-shirt with Braziliant! on it? Who knows? So yes, Brazil is at a very important turning point in its history. Will it be the case that it loses its passionate creativity which led to the people of this country fighting against a dictatorship and corrupt political class, thus sinking into consumerism where people are mere property of brands. Or will it rediscover its Braziliance, its wonderful resourcefulness which comprehends chaos in a way which is much more profoundly grounded in reality and nature? I can’t answer this, but it was truly an honour to teach at Sustentare where I get just as much out of teaching as I hope the students do in learning.